Earlier this week Intel announced a $300 million Ultrabook investment fund to encourage development of this new class of ultrathin and lightweight laptops, but this might not be enough for some laptop manufacturers. Despite Intel sticking firm to its belief that Ultrabooks will be introduced at the target sub-$1000 price, DigiTimes reports that laptop makers remain skeptical, and some want Intel to lower its CPU prices as well as offer an additional $100 subsidy per unit for marketing to meet the price target. Everyone wants cheaper laptops. For ultrabooks to be successful in a highly competitive, tablet-obsessed and MacBook Air-dazed market, they'll need to meet that magic $999 or less price point Intel has promised. Otherwise, Ultrabooks may end up being just more premium laptops. Apparently the main glitch here is how expensive super-thin and high-quality laptops are to make. The total bill of materials (BOM) for the 11.6-inch Ultrabook is expected to be priced at more than $700. Cheaper laptop materials like fiberglass instead of magnesium-aluminum for the chassis and cheaper SSDs could lower the cost of Ultrabooks, but these are still in development. The unnamed laptop makers who argued for Intel to offer additional incentives may have sound business bottom line reasons to take their "wait and see" approach before joining the Ultrabook project . . . or they may find themselves behind the curve. Either way, a note to Intel and laptop makers: just work it out, ok? 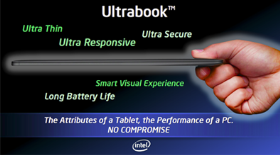 We want to see those Ultrabooks for under a grand.